On our holiday to Malaysia last year, we ended up taking a detour to Phuket. 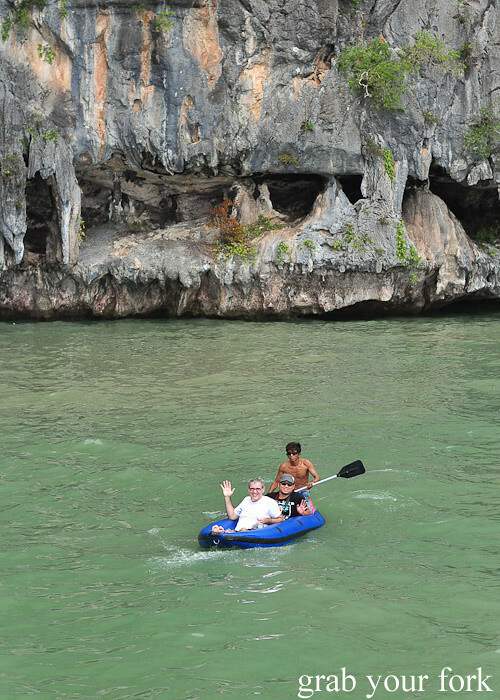 We had two full days in Phuket, and like most tourists in the area, we booked ourselves on a island-hopping boat tour. 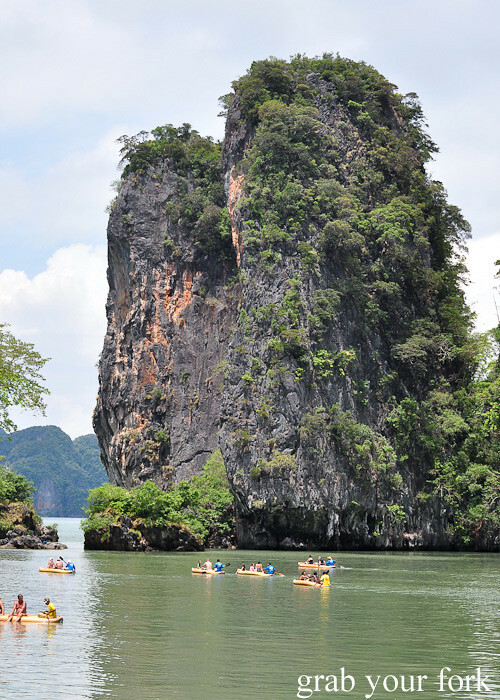 We went with Holiday Sea Canoe to see James Bond Island, involving a 7.30am transfer from our hotel to the pier at Ao-Poh in Phuket's north. Our boat is large, with about 25 tourists on-board, and a dozen locals travelling as guides. 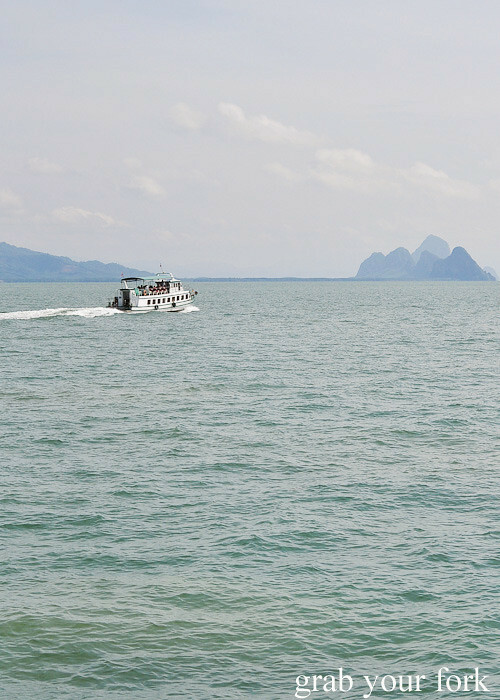 We chug our way past picturesque islands before finally dropping anchor in Phang-Nga Bay National Park. There's the squeaking sound of rubber and a commotion below deck before we look over the side and realise that a dozen sea canoes are being pushed out onto the water. 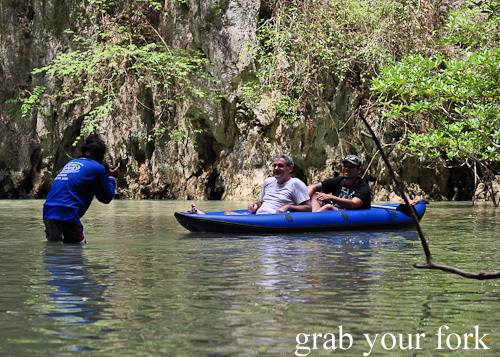 It's two tourists and one guide per kayak, involving a treacherous wobbling embark given that I'm holding my DSLR in a plastic bag. 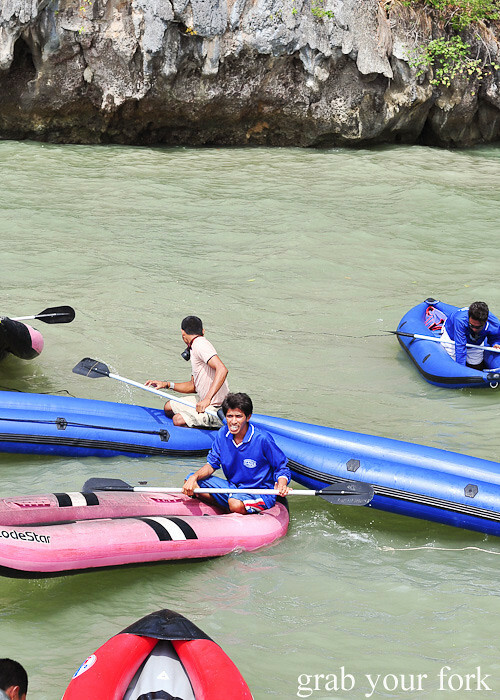 I'm tucked in behind Minh and our guide perches at the very back, deftly gliding our boat with a paddle, using precise and seemingly effortless strokes. An eerie silence descends over us, as everyone quietly admires the surrounding scenery. 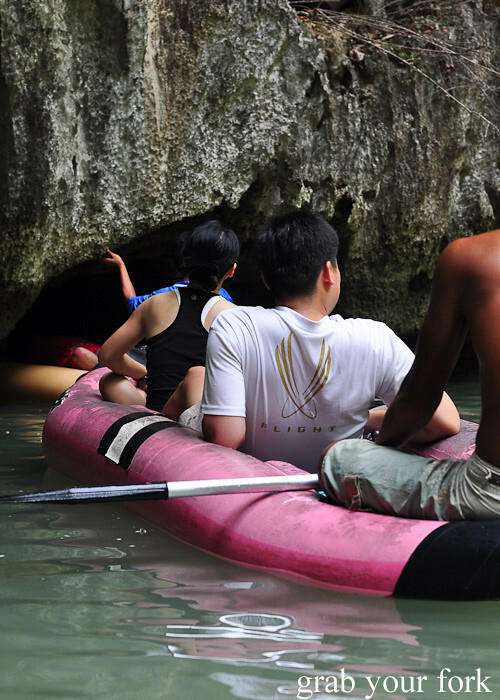 The limestone caves soar above us, and for several minutes we glide around the bay, hearing only the gentle splash of water against the paddle. It's magic and mysterious. 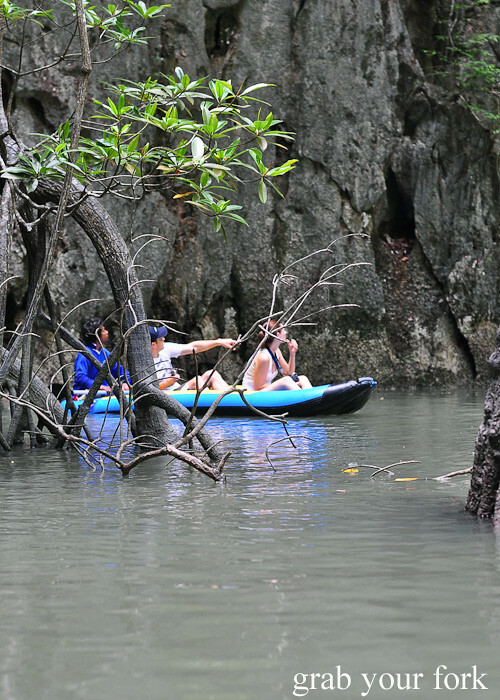 Phang Nga Bay stretches for 400 square kilometres, and includes about 100 islands. 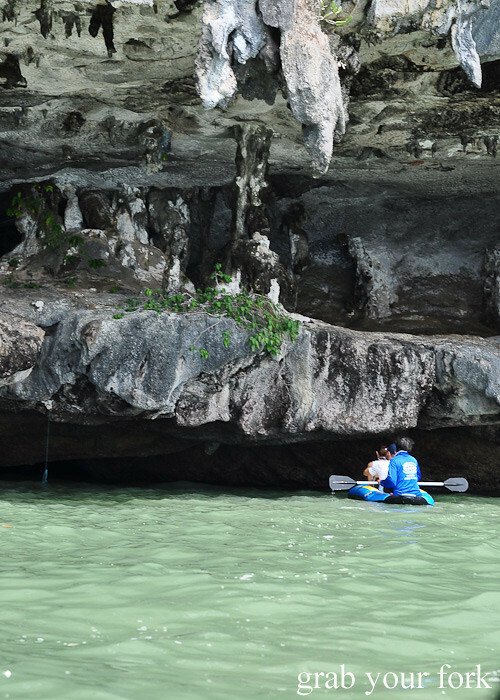 Several limestone islands contain caves that have gradually had their floors collapse due to erosion. Locals call these "hongs" or rooms. 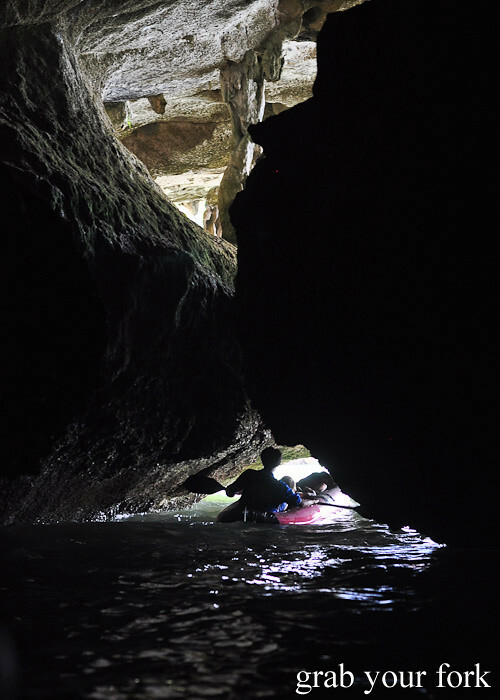 We patiently queue and enter the caves one kayak at a time. Inside it is cool and quiet, and looking overhead we can sometimes make out cracks of blue sky through the soaring ceilings. We explore a number of hongs, or rooms, but the last one is most hair-raising. Due to the current high tides, the ceilings are relatively lower and we're warned to keep our limbs in the boat as much as possible and to point the flash light upward for our navigator. It doesn't seem too bad until we realise the corridors are getting narrower and the roof of the cave is rapidly dropping. The cave becomes practically pitch-black but I can smell the wet limestone and hear drips of water that echo. There's a moment of panic when both Minh and I realise that the roof of the cave is terrifying low - I'm certain that my nose is about to be scraped by rock. I bury my head deeper into the kayak, petrified, sucking in my breath in a futile effort to contract myself. There's the scrape of rock against rubber as we jerkily make our way through - I'm not a claustrophobe but it's the nearest I've felt to panic. 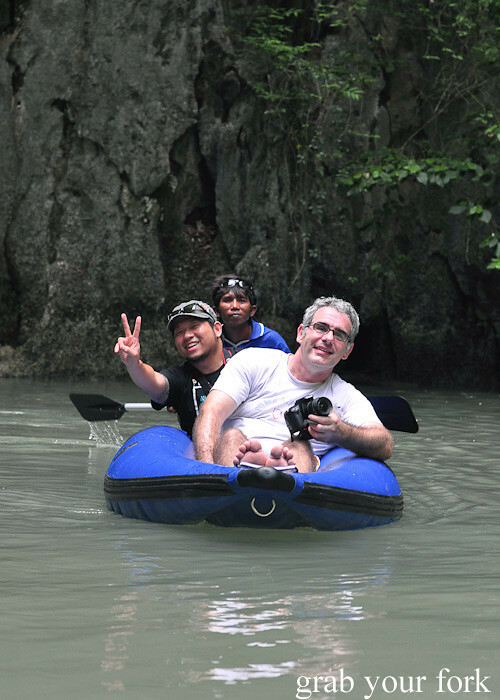 I have no idea how our guide is contorting himself to push and steer the boat, but we make it. We sit up with relief, gulping in fresh air as our hearts continue pounding. 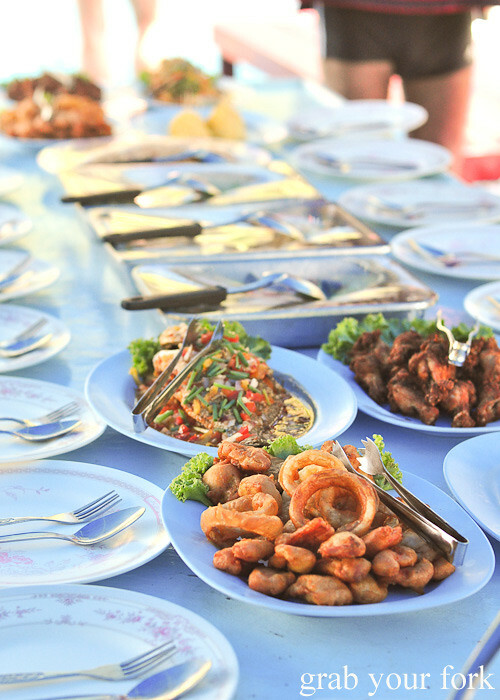 Lunch is an on-board buffet, a mixture of steamed fish, deep-fried calamari rings, chicken legs, salad, noodles and rice. We move onto Ko Tapu next, the spectacular limestone rock formation made famous in the James Bond movie "The Man with the Golden Gun". 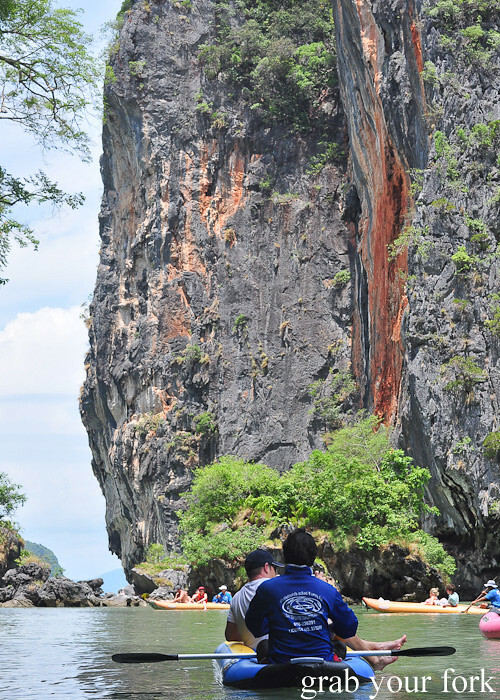 James Bond Island is so famous now that a strip of tourist stalls have been set up on the beach to tempt the boat loads of tourists that arrive. 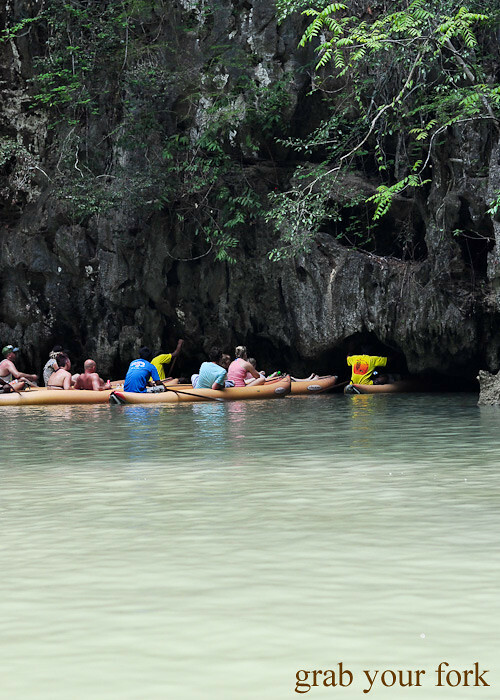 We take a stroll around the island, exploring the myriad of caves, before getting our kayak again and returning to the boat. 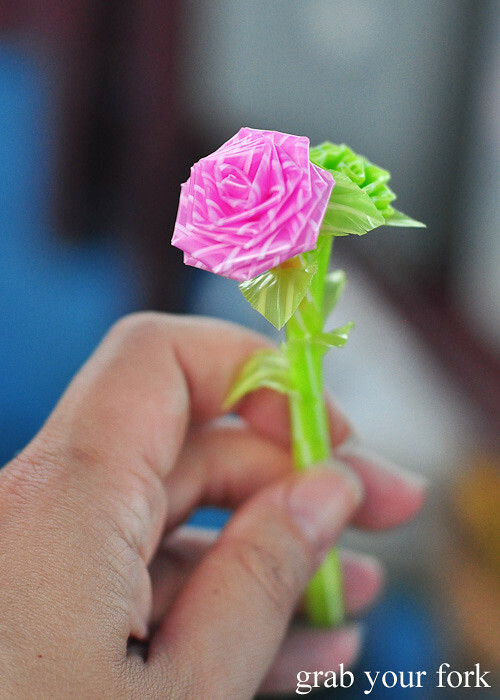 On the journey home, our tour guides are full of charm and good humour, entertaining the crowd with magic tricks and making roses from plastic straws. Minh and I end up asking them how to make them, and we sit at the back of the boat patiently twisting the plastic under their direction. 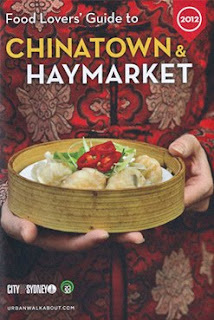 We're assured that the markets will close late, so we vow to return again with our cameras. However when we come back an hour later, the markets have vanished, as though they never existed. We kick ourselves that we didn't buy more (like cups of fresh soy milk for AU20c and coconut desserts and banana fritters and more) but really we have more than enough for a light dinner for four. The moral of the story, of course, is to never leave your camera in the hotel room! 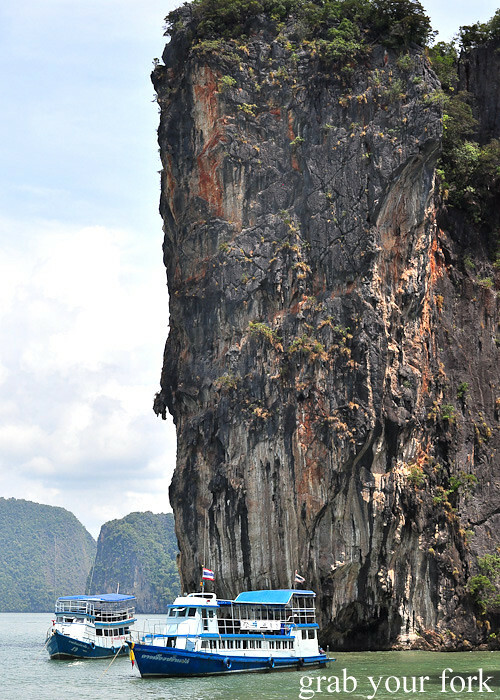 I remember my James Bond Island tour guide being hilarious! Making us all pose James Bond style. His name was Woody... ahhh.... I wish I could go back instead of going to work. 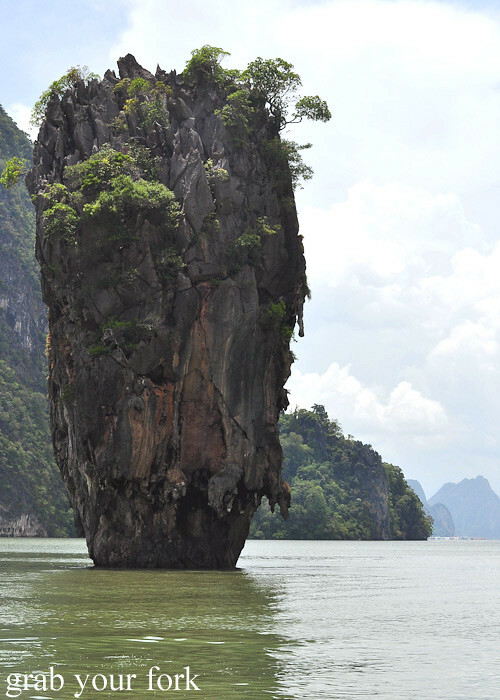 James Bond Island! I'd almost forgotten about that crazy trip through the caves, but I don't think I was as freaked out about it as you were lol. Oh that mystery market... I still mourn its loss. What an awesome holiday! I'd so love to go through those caves, would be similar to the grottos in Capri, minus the very low roof! The caves sound fascinating and the whole area looks so stunning. 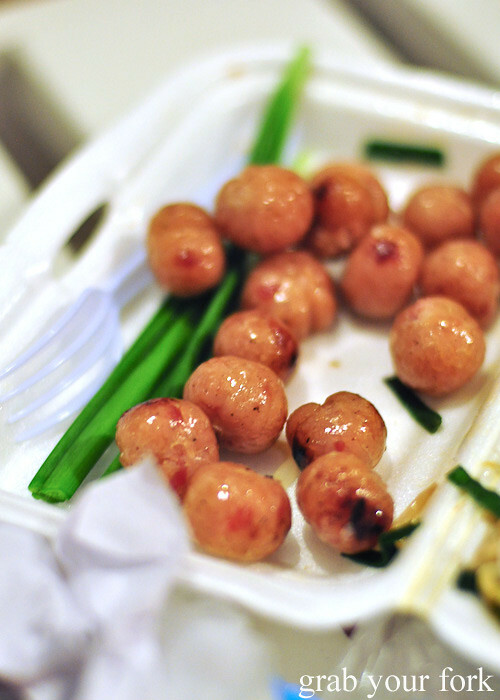 Your dinner from the markets looks so great, love the look of the bbq sticky rice balls, yum. Love the shots Helen...it's great looking back at all the memories! 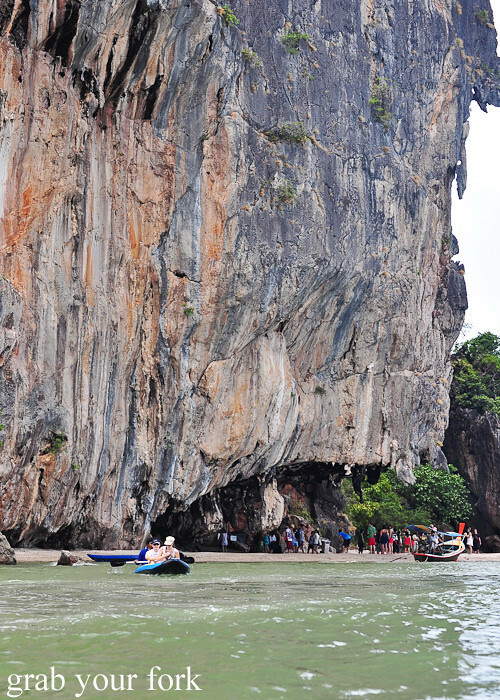 I have yet to visit Phuket and I def want to do Phi Phi island one day. LOL I'll forever love that last photo! Teehee! I honest-to-goodness was just watching/listening to BIlly talk about his chocolate cake on Masterchef when his photo popped up on your blog! Wow wow wow wow. And that's not even for the food (this time, and this time alone).. the thought of being in that cave though.. oh golly - I don't think I could.. We spent an hour or more (felt like a year) going through a lava cave near Mount St Helens in the US and it was terrifying. No more caves!! 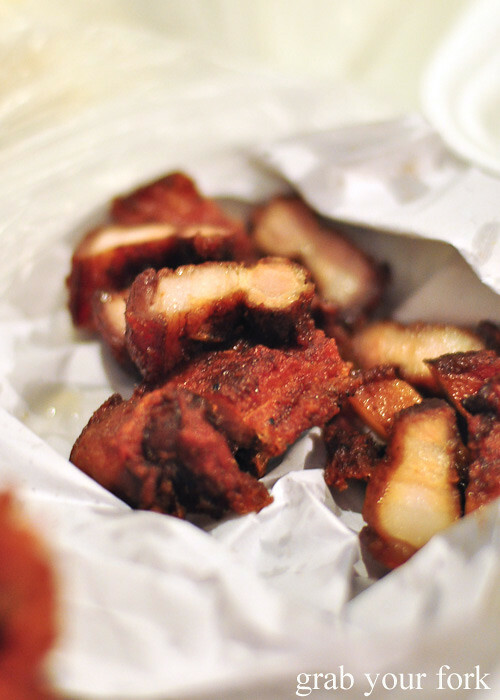 That roast pork belly makes me want 2nd supper though - an apple just won't cut it sudenly! And loving Billy on Masterchef - you must hassle him for the twice cooked pork belly (for all our sakes).. it looked DELICIOUS. Love the James Bond style pose shot at the end, bet that one always brings a smile to your face. This place is unbelievable. 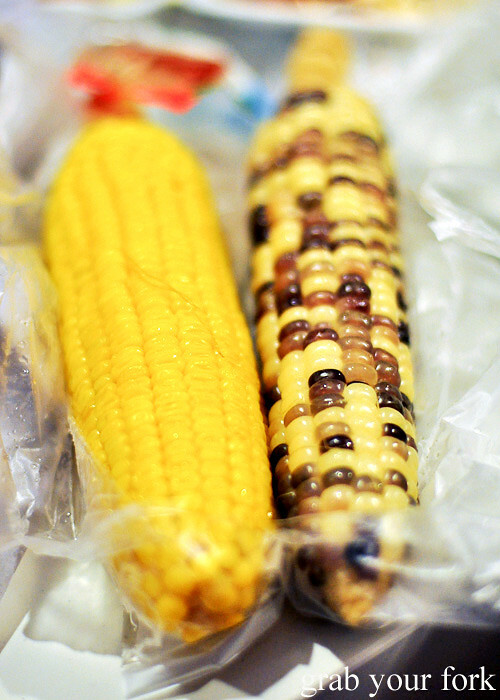 And look at these prices - $1 for 2 fresh corns! Did that exact sea kayak tour last year in October. We started the tour late in the day and so was still out there at night. We made an offerings using flowers and banana leaves and lit them in the lagoons. And in the dark if you shook your hand in the water, there were glowing worms that would light up. Hi John - Argh we were all kicking ourselves. I'd checked with a local about when they closed but when we returned half an hour later everything was packed up and gone. 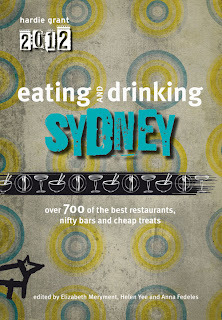 Hi Iron Chef Shellie - Our guides were great, and yes hasn't it been awesome watching Billy on our teevee! 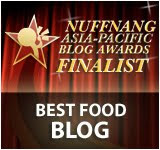 Hi Nic - Congrats! 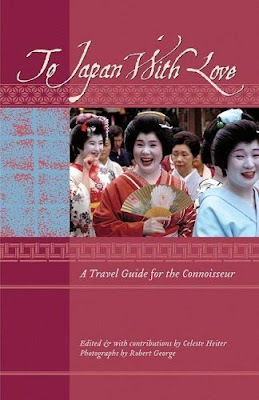 I'm sure you will have an amazing honeymoon! Hi Minh - I think you had the better spot because you were at the front so you could lie down completely. I was trying not to lie down in the lap of our guide. haha. Hi Sara - My rose-making skills were terrible, I have to admit, but I agree, it makes a great party trick! 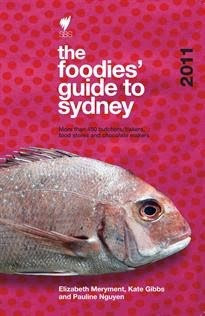 Hi Claire - You can get Billy's recipe for his twice cooked pork on the MasterChef site here. Hi Chanel - It wasn't that scary. I was just worried I might lose some skin off my nose. lol. Hi Paul - Wow, your tour sounded amazing. I can only imagine how magical the glow worms must have appeared!